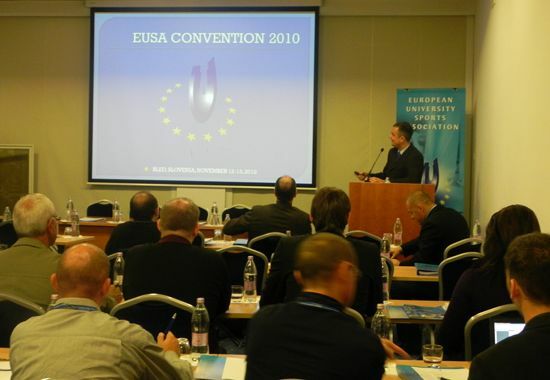 The EUSA Convention 2010 started today in the afternoon. 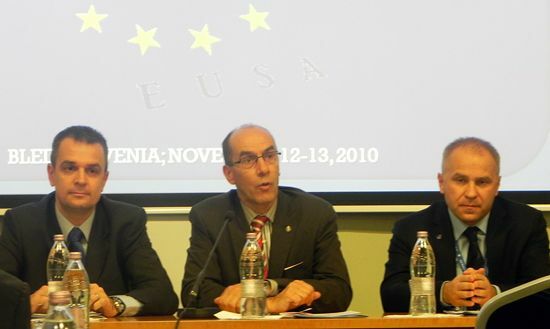 The Convention, which is intended for the organisers of the next European Universities Championships and the European Universities Games, is taking place in Bled, Slovenia between November 12 and 14, 2010. 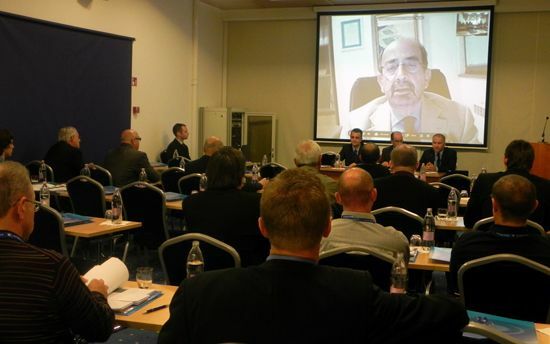 Over 50 participants – organisers of next EUC events, technical delegates, medical commission members, EUSA Staff and invited observers have been greeted by Mr Alberto Gualtieri via online address. Mr Gualtieri stressed the importance of EUSA Conventions as EUSA is working hard to cooperate with the organisers to enable great events. The participants were then also welcomed by Mr Leonz Eder, EUSA Executive Member and Treasurer, a.i. Mr Eder thanked the technical delegates, medical commission members and EUSA Office for doing an excellent job and the significance of their contribution to the development of EUSA and its sports events. 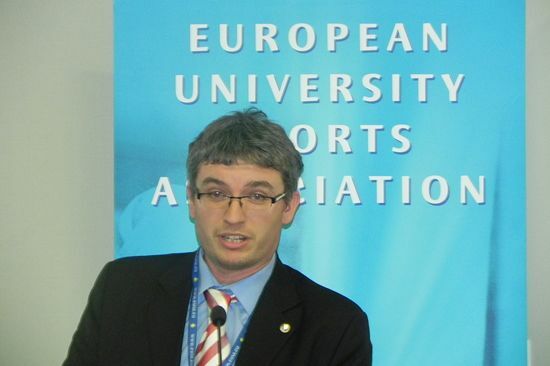 Mr Matjaz Pecovnik, EUSA Secretary General, briefly presented the European University Sports Association, its organisation and activities, focusing on the history and success of the European Universities Championships. 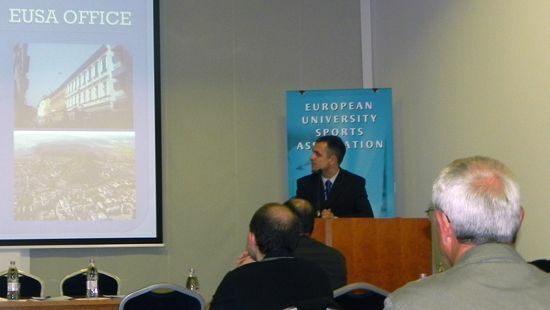 In his presentation, Mr Pecovnik also illustrated the growth of EUSA sports events and the plan for the future. Sports programme, rules and regulations were presented by Mr Adam Roczek, EUSA Sports Manager. Mr Roczek presented the organisation of a European Universities Championship through a technical point of view, and explained some of the most important guidelines in organising such an event. Dr Haris Pavletic, Medical Commission Chairman, presented the medical commission and safety & health issues which are important to observe in organisation of EUSA events. He stressed the importance of the appropriate medical assistance, catering needs and requirements and the hygiene conditions during the championships. EUSA Volunteer programme, run by EUSA Student Commission, was presented by Mr Andrej Pisl, EUSA Communications manager on behalf of EUSA STC. 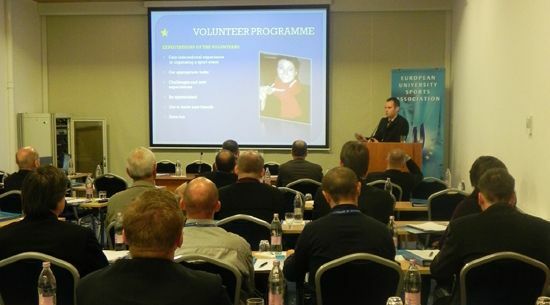 After a short introduction of the commission, Mr Pisl described the Volunteer programme, its advantages for the organisers and the volunteers themselves, and stressed the importance of volunteers in sport, especially in University sport. The Convention continues tomorrow with the rest of presentations and workshops for the organisers of next year’s European Universities Championships. 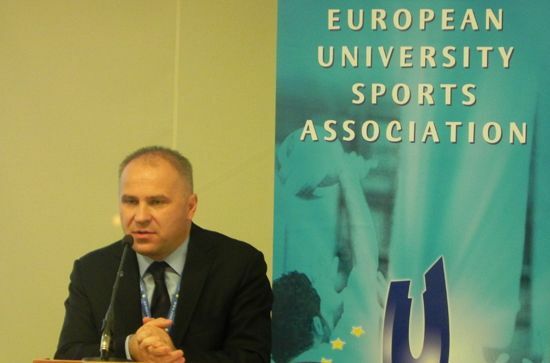 In 2011, there will be 16 sports offered under the umbrella of the European University Sports Association (EUSA).